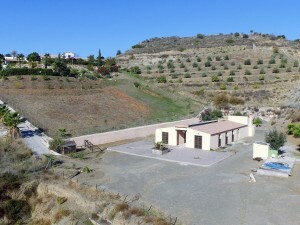 Amazing country house / B&B with separate apartments and buildings and a swimming pool with a total of 18 bedrooms and 6 bathrooms with 700m2 build size on a plot of 23.965 m2 just outside the village of Antas. 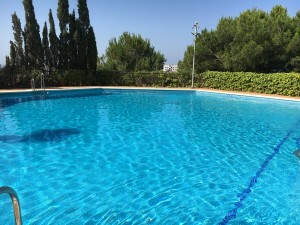 This property is situated just a couple of minutes of the village of Antas where all amenities can be find and only 15 minutes to the beaches of Almería. From the house and all the buildings there are amazing views! There are large double gates to enter the property. There are a lot of nice terrace, garden and seating areas all around. On the left hand side there is the double storey house which can be used as a private home. Entering the front door there is the very spacious lounge. To the right there is an hall way with 4 bedrooms. From the hallway a door leads outside. Directly to the right a staircase leads to the roof terrace with a little apartment with 2 rooms and a bathroom. Back to the lounge there is bathroom and an open fully equipped kitchen. From the kitchen a door leads to a very big terrace with an outside summer kitchen. In front of the house and next to the house there are a lot of mature trees which give a lot of shade. At the back of the house with a couple of steps there is the swimming pool surrounded by a tiled terrace where there is enough space for all the guests to relax and enjoy the pool area. The house needs modernization. On the right hand side of the house there is the huge warehouse divided in 6 sections. 1.: An huge storage room with an utility room. 2.: Another huge storage room, both storage rooms can be made into apartments. 3.: Apartment with 2 bedrooms, bathroom, lounge, kitchen (not fitted) and a storage room. 4.: Apartment with 1 bedroom, bathroom, lounge, fitted kitchen, storage room. 5.: Apartment with 2 bedrooms, bathroom, lounge, fitted kitchen, storage room. 6.: Apartment with 2 bedrooms, bathroom, lounge, kitchen, storage room. All these apartments can be easily rented out for long term rental or as a holiday rental. At the end of the warehouse there is a huge, terrace with a bbq area, Mature trees give this area a lot of shade. Behind the warehouse there are another 2 new built apartments. Each apartment has a lounge, 3 bedrooms, bathroom, kitchen (not fitted). It will be easy to finish these apartments. Right behind these apartment there is also a dog kennel. Also, behind the warehouse on the mountain there is a big balsa of 25.000 liter. The property has also water rights. The garden has a lot of mature fruit (trees). This amazing property can be converted with a bit of TLC in a holiday complex such like a B&B, holiday rentals, long term rentals. 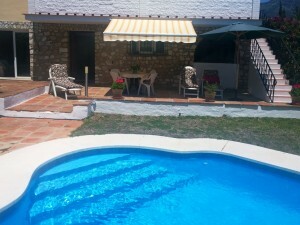 The location is just perfect: close to the village and the beach! The views are stunning and as the property has an established garden which gives the clients a homely feeling. A viewing is highly recommended!